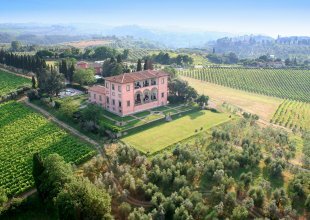 A historic Florentine villa with contemporary comforts in the middle of the Chianti region in San Casciano Val di Pesa, only a few minutes driving distance from Florence. With views over the emblematic landmarks of Giotto's Bell Tower and Brunelleschi's dome, this classic Renaissance style villa, is in its element in its wonderfully elevated position overlooking swathes of beautiful Tuscan countryside. Climb up to the top of the property's central tower and you will find sublime panoramic views over the villa's own lovely estate grounds and beyond. The villa's grounds, which include a large swimming pool, tennis court, terraces and lawns and even a small soccer pitch are criss-crossed with paths enticing you into lovely walks in spectacular surroundings. There's an English speaking team at the villa who will provide daily housekeeping and breakfast service as well as being available to cook evening meals.